Each year, about eleven tropical storms develop over the Atlantic Ocean, Caribbean Sea, and Gulf of Mexico. Many of these remain over the ocean. Annually, about six of these storms become hurricanes, and only two become major hurricanes sometime in their lifetime owing to the difficulty in getting all the right conditions for intensification to Category 3 status or higher. Roughly two hurricanes a year strike the United States coastline anywhere from Texas to Maine. 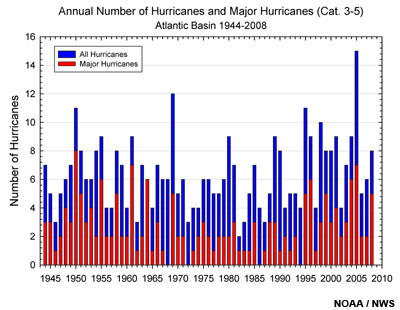 Fewer hurricanes in a given year, however, do not necessarily mean a lesser threat of disaster. Intense hurricanes and hurricanes that do significant damage certainly have occurred in years with much below-average hurricane activity. For example, in 1992 there were only 7 tropical storms, four hurricanes, and 1 major hurricane-Andrew, which devastated southern Florida. The modern era of hurricane monitoring in the Atlantic basin began around 1944 when aircraft first flew into hurricanes to monitor their position and intensity. However, the most reliable data have been collected since the 1960's when weather satellite imagery became available. 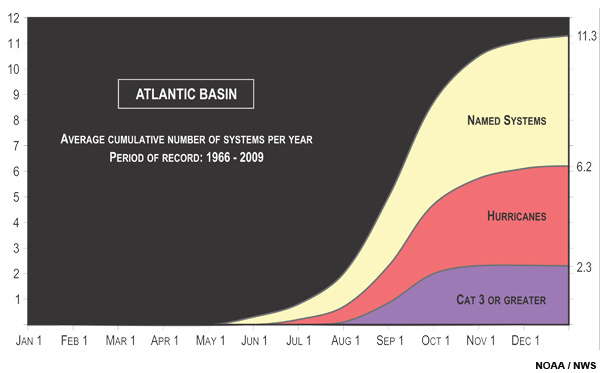 The graph above shows that the number of hurricanes in the modern era has ranged from as few as 2 in 1982 to as many as 15 in 2005. Many years have had no landfalling hurricanes in the U.S., while the most to hit the country in one year was 6 (1985).